Advance is the result of a two years of investment and development. Advance was specially developed for engineers and structural designers looking for a complete and simple software, totally integrated into AutoCAD® to produce all their construction drawings. 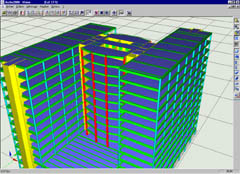 Perfectly integrated into AutoCAD®, Advance accelerates the conception of civil construction buildings offering designers and engineers a library of structural elements (slabs, beams, columns, walls, foundations...), openings (doors, windows, depressions, openings, niches…) and a materials and standard sections database. From this model, it generates all construction drawings proposing a large palette of view production tools, dimensions, annotations, symbols and automatic layout functions. Since it was launched in 1993, Arche has become the standard software for designing and drawing reinforced concrete buildings. From a 3D model building comprising slabs, beams, columns, walls and foundations, Arche analyzes the overall stability of the construction and automatically creates all the reinforcement drawings. 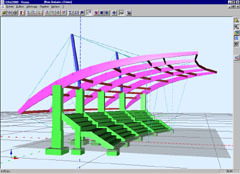 Arche Building Structure is a building simulation software enabling fast and rigourous studies of loads carried to the ground, wind bracing and earthquake phenomena, in accordance with standard trade methods. The Arche reinforcement modules are software dedicated to the design, analysis and automatic production of reinforced concrete reinforcement drawings. Show the geometry, loads and general assumptions and a simple mouse-click will give you the stress and strain curves in concrete and steel, the deflections and, of course ...... the reinforcement working drawings! With Arche Ferraillage, you have a top level software which optimizes the design of the reinforcement layout by drawing on the working practices of the industry. Acknowledged by the profession and adopted by the most demanding engineers, Effel is the first French program to offer a complete environment for calculating structures dedicated to the construction industry. We all know the Stade de France , the French Library or the Palais des Congrès in Porte Maillot in Paris, but did you know that these constructions, and thousands of others, were designed using Effel? Effel is now ready to mesh the structure (controled, Delauney, imposed meshing, mesh refinement) and perform finite element analysis in static and dynamic modes (natural modes, earthquake, vibrations, shocks, etc. ), generalized and nonlinear buckling (tie and compression-only elements). In addition to these basic functions, however, Effel can also detect errors in description and offer technical solutions. From the structural anlaysis, Effel checks and optimizes the behavior of the construction in accordance with the regulations. Since Effel was launched, its calculation core has been at the forefront of the finite element technology. Moreover, ANVAR (Agence Nationale de la Valorisation de la Recherche (French Agency for the Promotion of Research)) has acknowledged it as an innovative French product.